Freshman Cammie McKinney poses on the super H in the gym. McKinney is the only freshman on the varsity girls basketball team. 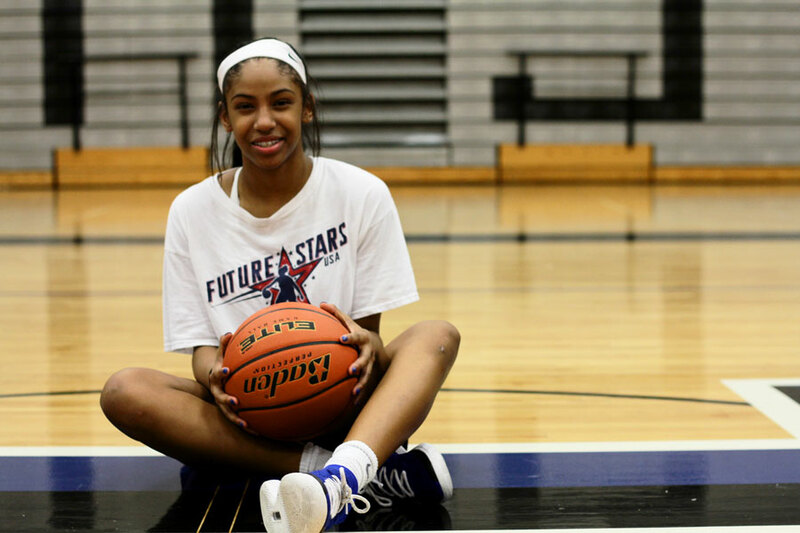 She was around 5 when she began playing basketball at Little League, 11 when she realized it was something she wanted to continue with, and 13 when she received her first college offer from University of North Texas. Now 15, freshman Cammie McKinney serves as the point guard for varsity girls basketball as she continues to work toward crossing more milestones in her basketball career. This year, Cammie is one of the two new starters on the basketball team. When Cammie was 5, she was already involved in almost every sport except for basketball until her mother, Aarolyn McKinney, suggested to try it out. Ever since Cammie began playing basketball, she has played the point guard position on the team. So far in this season, the Lady Hawks have a winning record of 25-2 in the district; Cammie said the team’s achievement makes her feel she has been helping with its success. Aarolyn said she first realized Cammie’s potential when she played in her first National Championship game in Oklahoma in 4th grade: with eight seconds left, Cammie drove the length of the court, got fouled and hit the game-winning free throw with one second left. The second time was last summer in the Jr NBA Regional Championship game when she scored 35 points for the team. Cammie said growing up playing basketball has helped her communication skills grow and change her as a person. Her experience playing in sixth grade, when her team was down by 12 with three minutes in a game and ended up winning last-minute, reaffirmed her belief that anything is possible with teamwork.